Released in tandem with EMI's huge Why Pink Floyd...? campaign that includes remastered CDs, an SACD, Blu-Ray DVDs, memorabilia box sets, LPs and more from their legendary catalog. 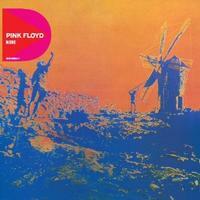 Remastered by James Guthrie with artwork by Storm Thorgerson. In 1969 the band collaborated with filmmaker Barbet Schroeder to provide the soundtrack to the film More. The new Discovery version presents the original studio album, digitally remastered by James Guthrie and reissued with newly designed Digipak and a new 12-page booklet designed by Storm Thorgerson. This release is part of a larger Why Pink Floyd...? campaign by EMI. The releases are designed to appeal to a wide cross section of their fans, with music to excite first time listeners, while super-deluxe box sets will cater to dedicated fans, allowing them to immerse themselves in multi-disc sets, containing alternate takes, unreleased tracks, restored live concert screen films and a live recording of the legendary The Dark Side Of The Moon performance at Wembley in 1974. A series of different listening experiences have been specially created for this release: in addition to remastered CDs called Discovery and the Immersion CD/DVD/Blu-Ray/memorabilia box sets will be a series of Experience Editions - coupling one classic album with a further disc of related content from that album to offer a deeper listening experience. Storm Thorgerson, the band's longtime Art Director, has overseen the visual design, including new booklets for all the CDs, new artwork for the box sets and menus for the DV content. Respected photographer Jill Furmanovsky has edited books of original unseen photographs. Pink Floyd collaborators James Guthrie (in the U.S.) and Andy Jackson (in the U.K.) have been in charge of digital remastering to the highest audio and audiovisual standards.